When working with schools, I often hear, "I don't have time to teach SEL. I have a lot on my plate right now." It is true that in order to successfully implement social and emotional learning (SEL) programs and services, teachers and schools need to invest their most precious resource: time. Teaching an SEL curriculum, creating school-wide activities, or receiving professional development also requires commitment and some strategic planning. Are you discouraged by this? Don't be! The good news is that there's another side of the story: many teachers already use teaching strategies that support students' growth in this area. Do your students reflect on their work? Do you use pair-shares in your instruction? Do you celebrate your students' accomplishments? If so, you might already be supporting students' social and emotional development! Many teachers intuitively know that connecting with their students at an emotional level is key for young people's academic, social, and emotional growth. These teachers care deeply about students, paying attention to the climate in the classroom, their students' engagement during instruction, or their response to feedback. 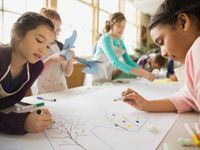 Research in the field of SEL has proven what effective educators already knew and had been doing all along: social and emotional skills have an important role in learning. Students bring emotions to the classroom from life outside of school. They might be dealing with a stressful situation at home like a parent losing his or her job, or maybe something more momentary like an argument with a friend. Teachers can see when something is off with their students from the moment they enter the classroom, and know that students may need support in cooling off or letting go of the emotion before they can focus on academic content. Students also experience emotions that originate in the classroom and are especially relevant to learning. For example, achievement emotions are feelings of success or failure (and everything in between) that result from classroom activities. In the charter school where I taught a few years ago, teachers openly discussed with students the anxiety and stress that came with certain activities, such as taking tests or public speaking, and helped students develop strategies that they could use in those situations. Although the school didn't have an SEL program at the time, teachers knew how to incorporate students' emotions during class to improve their disposition toward learning. Students can also experience emotions related to the topics addressed in class. Do you know students who get excited at just the thought of working in the lab or participating in an art contest? What about students that shut down in front of math problems or poetry? Great teachers care about the subjects they teach and have meaningful ways to share this passion in the classroom. Planning engaging lessons is a great way to incorporate social and emotional skills. Start by asking yourself, "What do I want students to know, feel, and do at the end of this lesson?" This practice addresses students' communication skills and offers an opportunity to engage in academic discourse. For meaningful participation in classroom discussions, students should listen attentively to others, pick out their ideas, and agree or disagree in respectful ways. Classroom discussions engage students' social and self-awareness, and enhance their ability to get along with their classmates. To what degree do teachers allow students to make decisions about their work? This might include developing norms and procedures for the classroom, but also giving students choices for ways in which lessons and activities can be completed. Providing choices in the classroom increases students' sense of ownership over their learning and develops their responsible decision-making skills. It matters how teachers talk to students. From an SEL perspective, teacher language should encourage students to monitor and regulate their own behavior, while providing warmth and support. Teachers are powerful role models when it comes to social and emotional skills. Students can learn from their teachers about positive ways to encourage others, display empathy, or solve conflicts. These three examples illustrate how teaching practices can support and enhance students' social and emotional development. In the next few days, observe your practice from an SEL perspective. How does your teaching support students' SEL growth? What other strategies could you incorporate to develop your students' social and emotional skills? Please share your thoughts and observations in the comments below.